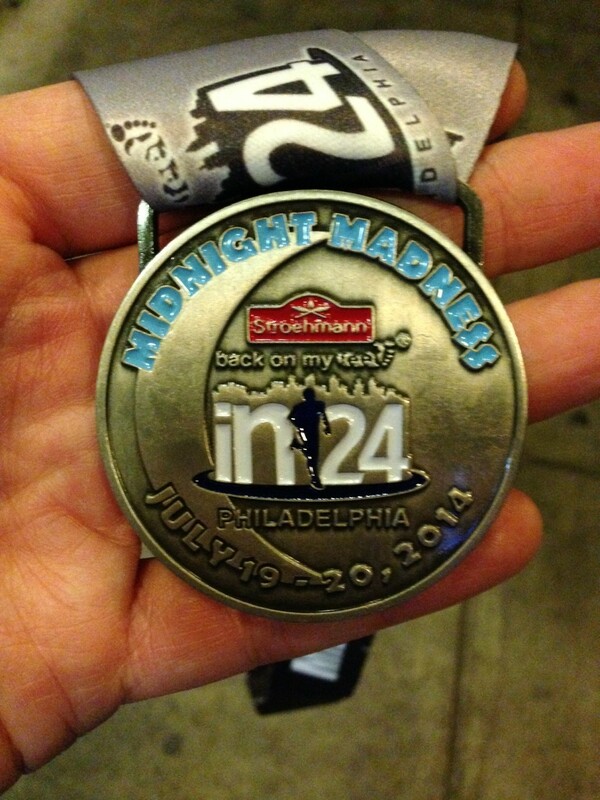 At the weekend I ran my first nighttime race, the in24 Philadelphia Midnight Madness. 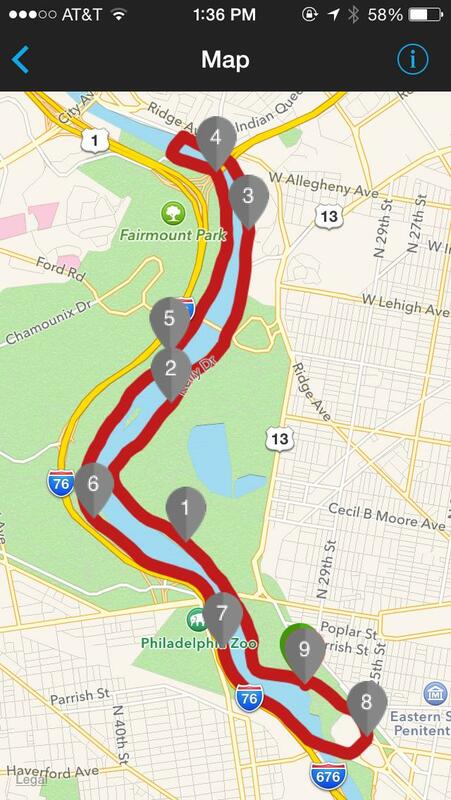 It is a mid-distance race through Fairmount Park and is run on the 8.4-mile loop around Philadelphia’s Schuylkill River. It was definitely unique. 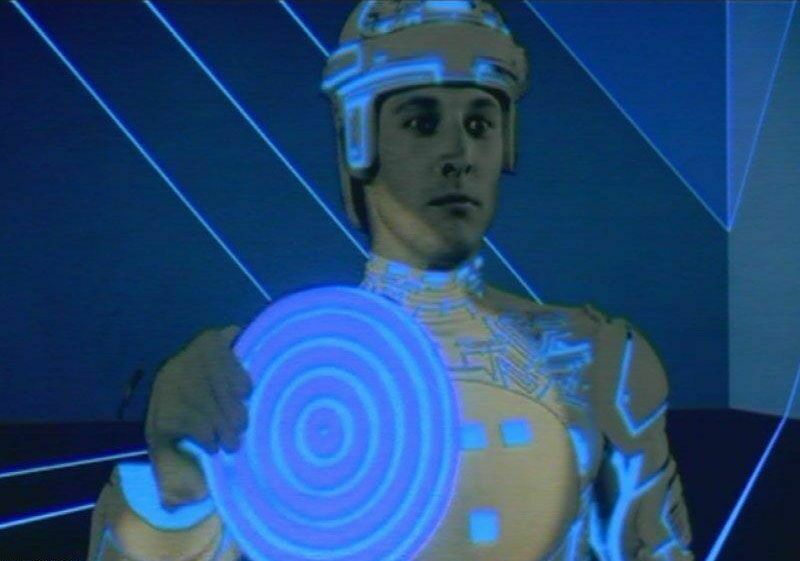 I even got to live out some of my ‘TRON’ fantasies from my childhood. It was part of the in24 Philadelphia weekend raising funds and awareness for ‘Back on My Feet’, a national organization that uses running to help those experiencing homelessness to transform their lives. 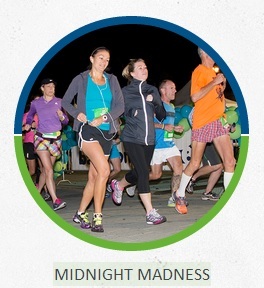 The weekend included an urban Ultra-Marathon, relay challenge, the Midnight Madness event and a 5K. I mainly train in the early mornings (I’ve been known to get up at 3am to run – not counting runDisney weekends) so this was a bit of an adjustment for me in terms of being on my feet all day and figuring out what and when to eat before the race. It was an interesting experiment in time management for sure. I have 4 weeks left until the ‘Chasing the Unicorn’ marathon and so I have been piling on the mileage recently. This left me a little tired going in, especially with a 12 miler that I had run the previous day (I was up at 3:30am in the morning) before work. 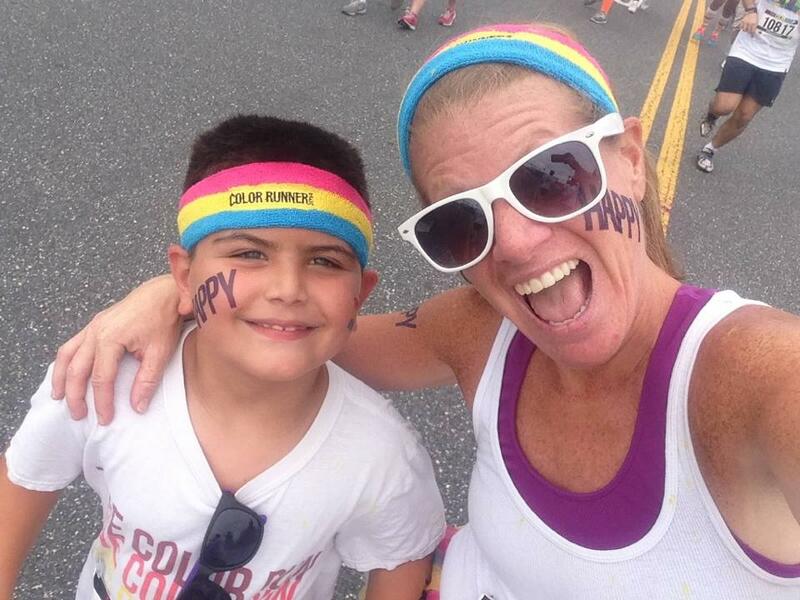 Luckily I almost got to sleep in a little on Saturday morning as my wife took my eldest son to do ‘The Color Run’ down in Philadelphia. I was able to relax a bit with my other little guy and we watched a lot of Disney movies in our pajamas. I spent the afternoon with the whole family and after putting the boys to bed I got myself ready, said goodnight to my wife and headed downtown to Philadelphia. The race was at midnight and I arrived around 10.30pm. I hadn’t been able to pick up my race packet the day earlier as logistically it was difficult for me to get to the host running store before it closed on Friday. I figured if I needed to return to my car to drop off stuff this gave me time. Thankfully there was bag check at the event. This was the look I was going for… Not quite the same. As I drew up to the start/finish area at Lloyd Hall on the banks of the river it looked a little like a tented village. In addition to the race tents and sponsors areas, many of the ultra-runners and relay teams had set up tents and camped out for the 24 hour event (10am Saturday through 10am Sunday). Check in was pretty simple and after pinning on my bib and getting my reflective gear on I checked my bag and waited with everyone else around the start line. 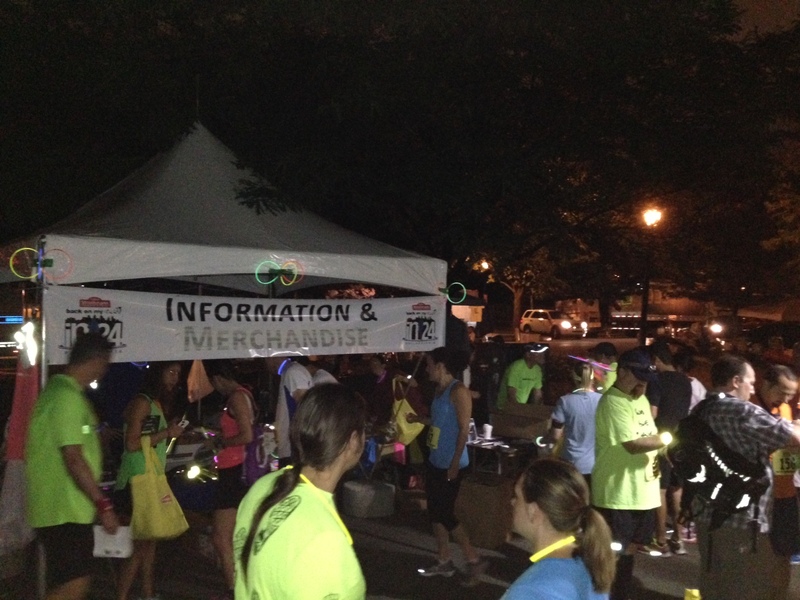 Next to the check in table was a table of night running gear and glo sticks which were free to take and provided by the organizers. 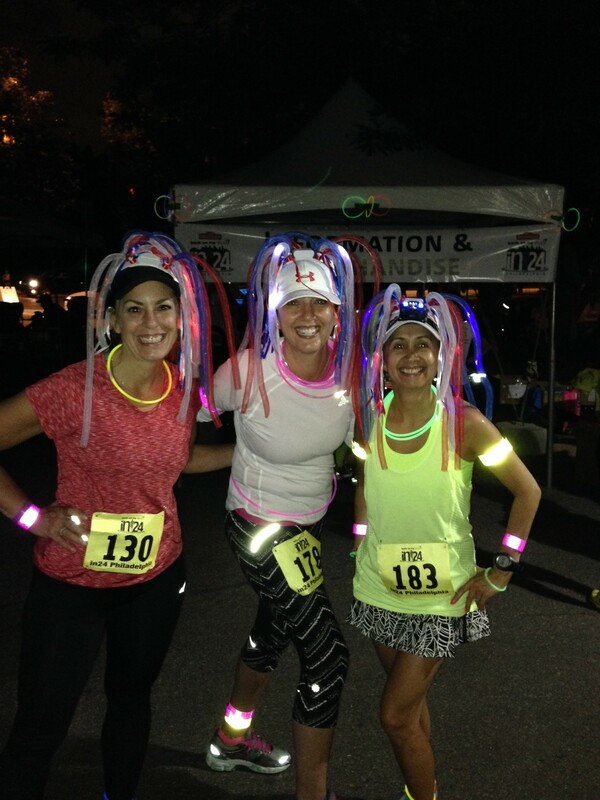 These included some reflective arm/leg bands, glo sticks and I think there were a few blinking lights available for runners. 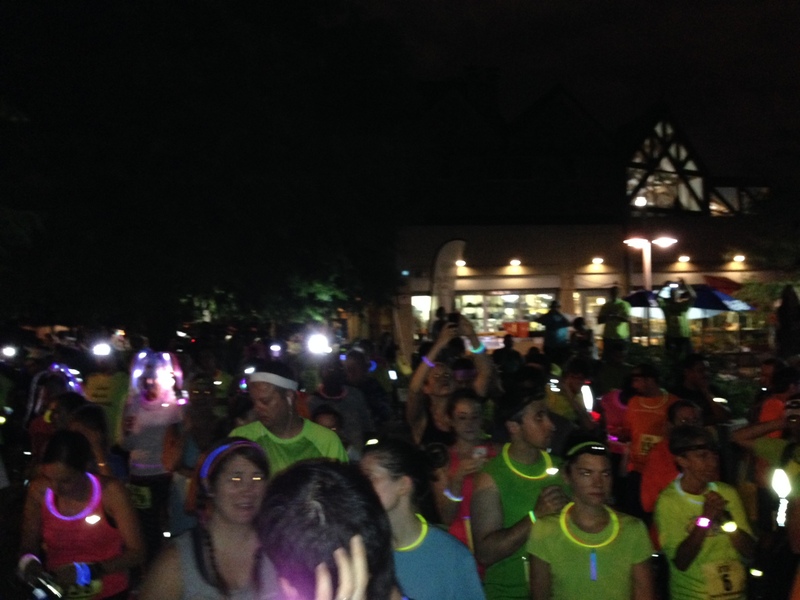 Runners were encouraged to wear headlamps in the race instructions and most people did that. 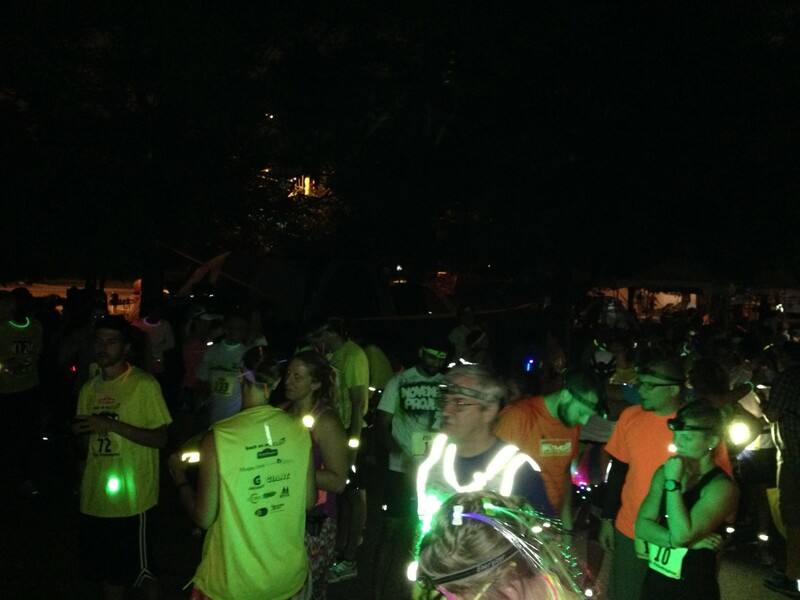 In addition to the running awards (top finishers) there was also a prize for best illuminated. Some people went to great effort and were innovative in their use of glo sticks. 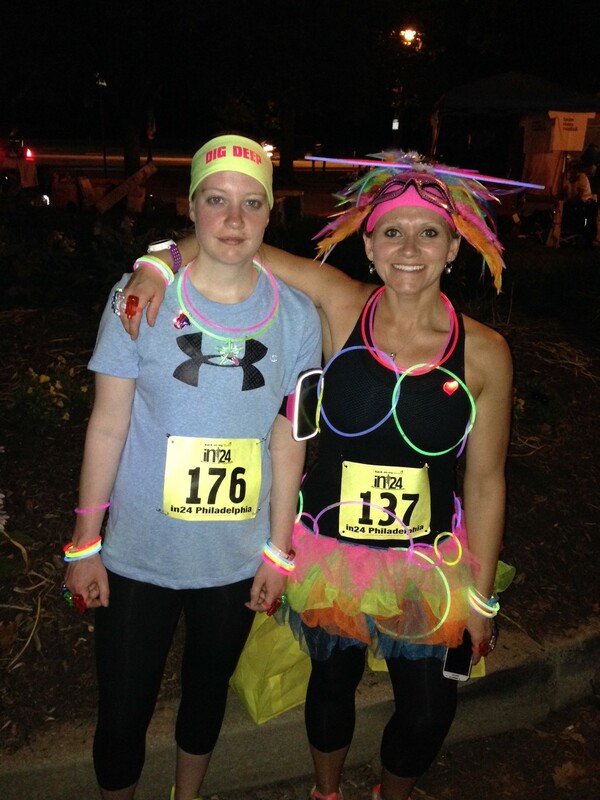 I saw a glo stick tutu, baseball cap and glasses as well as other uses. 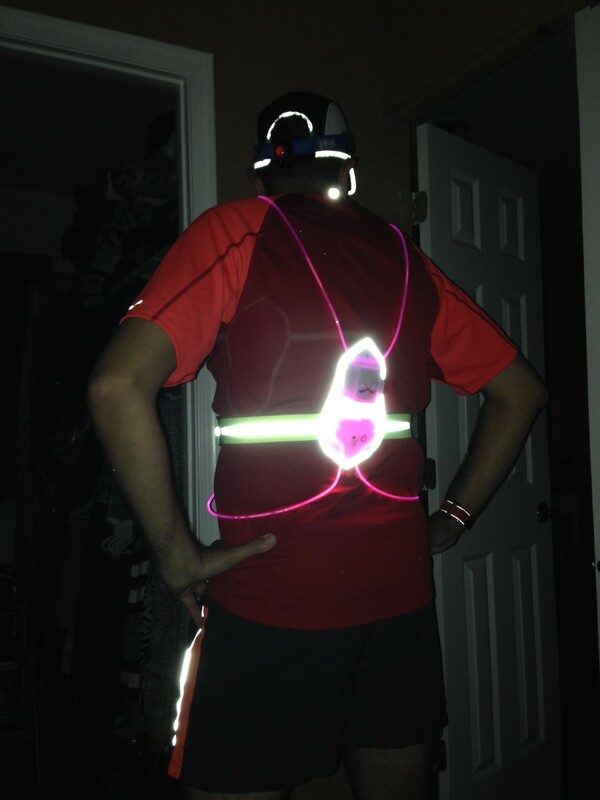 I myself wore my new Noxgear ‘Tracer 360’ light and reflective gear. In addition to standing out it was very lightweight and provided much entertainment it seemed for the other runners. 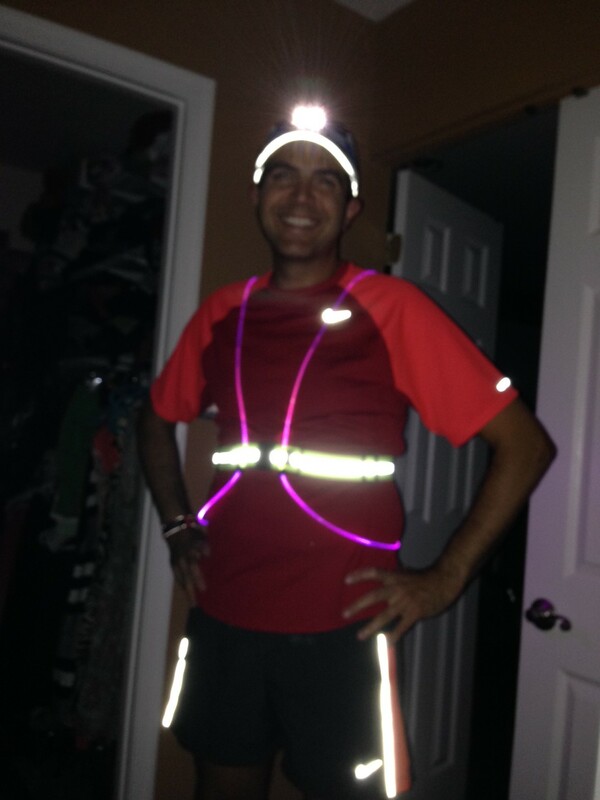 I have since had another early morning run wearing it (10 miles) and it is comfortable and stays put and is a little cooler to wear than my usual Brooks Nightlife running vest. In addition I wore my Petzel Tikkina headlamp and my Road ID Supernova lamp at the back of my hat (see my blog post about this gear here). People could certainly see me coming. Around 11:40pm the starter called us to the starting area and gave a few instructions. As there was another race still going on (the ultra) we were running anti-clockwise vs the ultra-runners going clockwise. The roads were not closed to other traffic so we obviously had to be aware of our surroundings and although I saw some people wearing headphones their use was not recommended and most runners did not. The starter made reference to the ultra-runners who had by that time been running almost 14 hours and still had about 10 more hours to go. He said they will look bad and smell even worse so we should give them every encouragement as we pass them by. I had been watching some of the ultra-runners run past while I was in the waiting area. They looked a mix runners going strong and some struggling but they kept it going no matter how hard it looked. Kudos to those guys. The Ultra was not a fixed distance of 50 miles or 100 miles but was how many 8.4 loops you could fit into the 24 hour period. 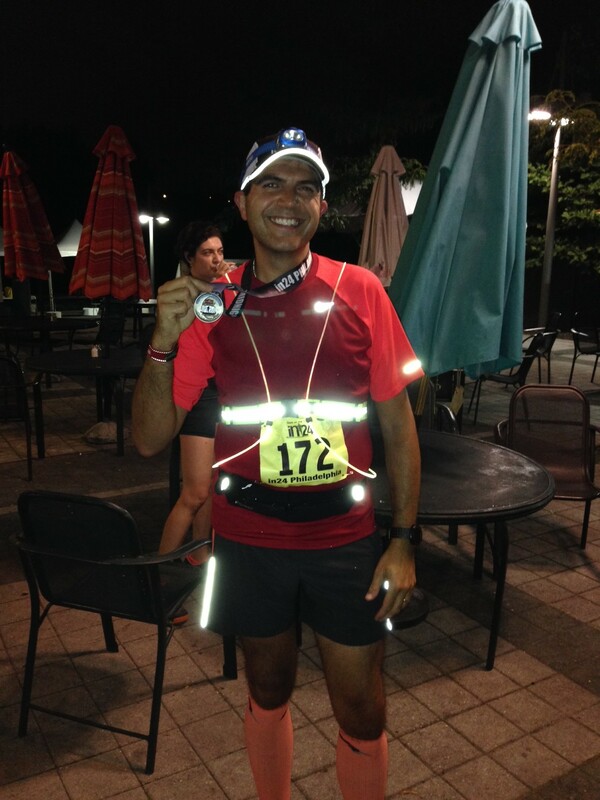 The winner was a 49 year old runner from Maryland who completed 17 x 8.4 mile loops (143.82 miles) in 23 hours 42 minutes at a sub 10 minute per mile pace. Wow…just wow!! Midnight came and off we went. It was still quite warm (around 70 degrees) and was a little humid but not too unbearable. All the runners stayed on the sidewalk so it was a little bunched up for the first couple of miles but it soon broke open and spread out as we progressed through miles 3 onwards. The street was fairly well lit with the street lamps alongside the river and other than a few shaded places and underpasses where you needed your headlamp it was fairly okay to run. They had about 4 water stations out on the course and the volunteers were very cheery considering the time of day. I used my usual run/walk intervals and pretty much stayed with the same group of folks from mile 2 through the end. 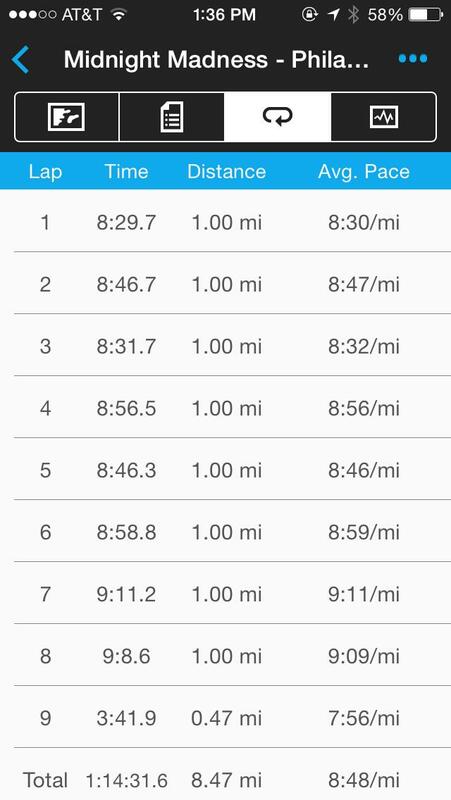 I felt comfortable with my pace although I did slow around mile 6 and 7 but picked it back up at the finish. The course was pretty flat with the only real climb coming up from West River Drive up to the Philadelphia Museum of Art. It is easier doing it as part of an 8 mile race than it is during the end of a half marathon for sure. I completed the loop in a time of 1:14:33. 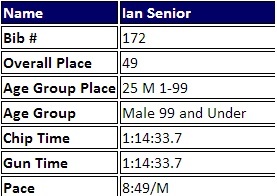 Good enough for 49th place (25th overall male) and at an 8:49 per mile pace. I’ll take that. The winner ran the distance in a time of 45 minutes flat. He was 8 minutes (yes 8 minutes) faster than the runner up. That’s quite a gap for such a distance race. Almost a minute per mile faster than the other runners. Every runner received a finishers medal as well as some post race refreshments. By the time I had finished it was 1:15am. I grabbed a bottle of water and ate half a pretzel. I just wanted to get home and go to bed at this point. It had been a long couple of days and I needed to catch up on my sleep ahead of my last big week of marathon training before the taper. I listened to the results of the races being called and no, I didn’t win most illuminated. As I walked back to my car there were still some runners out on the course doing the Midnight Madness and also many still running the Ultra. It was definitely fun and worth doing and I would recommend it for someone to try something different. I am not sure I would rush back to do it again unless I was running with a friend and I would have the ability to sleep in late the next day. 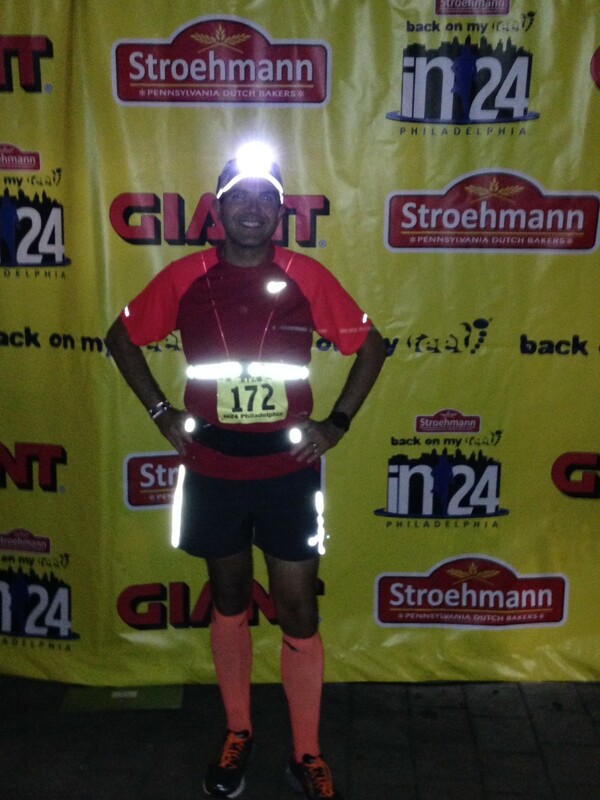 All in all I had a great time running this event and I am just in awe of all those ultra-runners. Lots of fun times in addition to running this month including a couple of nice surprises. I reached a new milestone this month. 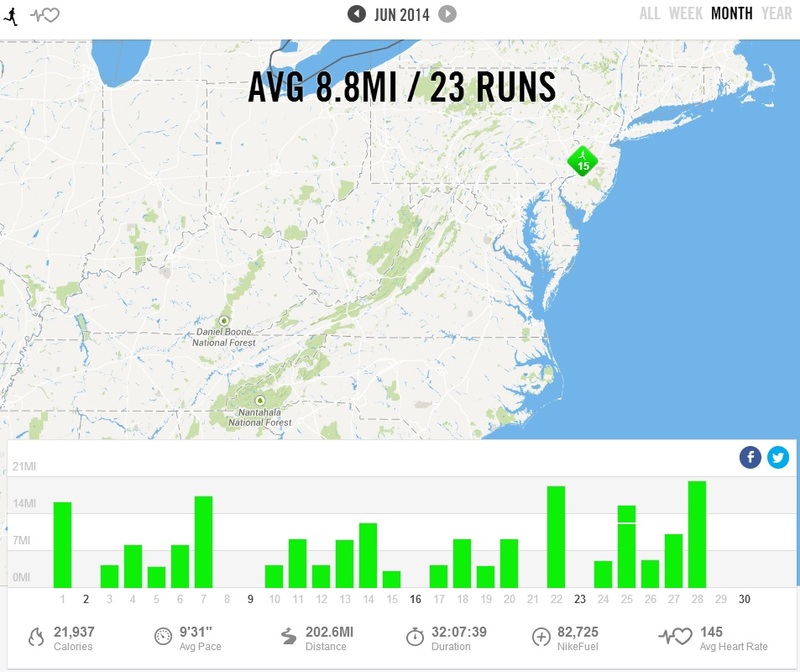 This was the first month since I started running that I ran more than 200 miles in a month (202 per my stats). No wonder I’m tired. This is mostly due to me using Hal Higdon’s Intermediate 2 plan which has more mileage midweek and an extra 20 miler in the plan (1 down and 2 to go as of June 30th). So far all is going well even as the heat and humidity makes the runs more of a workout than normal. I guess training for an August marathon will test your endurance. The month started with me continuing on the training plan for the marathon but now the distances are becoming greater every week. The good thing is that it is lighter in the morning and with the exception of when I had to travel out of town for work (more on that below) I have been able to run in the daylight and on a few occasions see the sun rise. It’s been fun. I am seeing a lot of familiar faces and a few new faces as I run my usual laps of the park. Good to see some folks out there making their first strides. I encourage with a smile and a wave as I run past as it seems everyone is plugged in but it is paying off now and I get the smiles back. Runners etiquette. Love it. 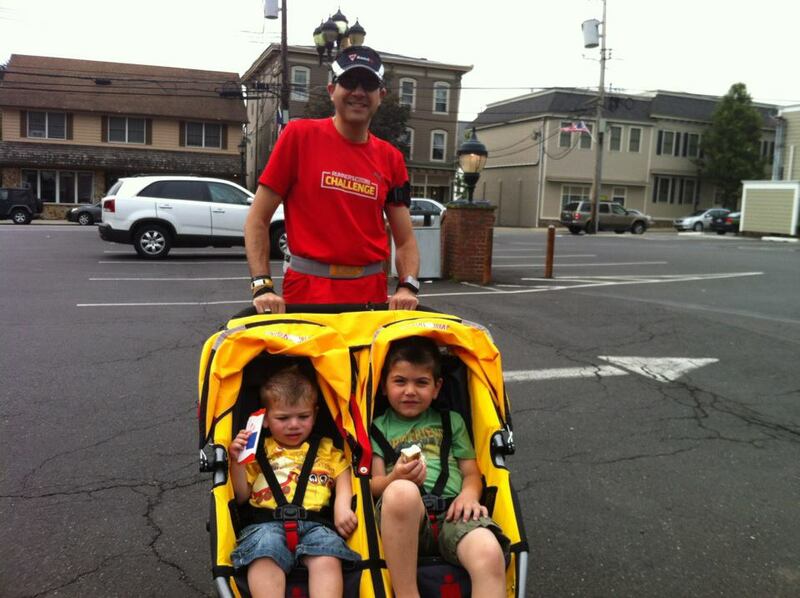 We finally said goodbye to our BOB Ironman double stroller. Our boys are just too big for this now and I was really struggling to run and push them and keep up with my wife when running. 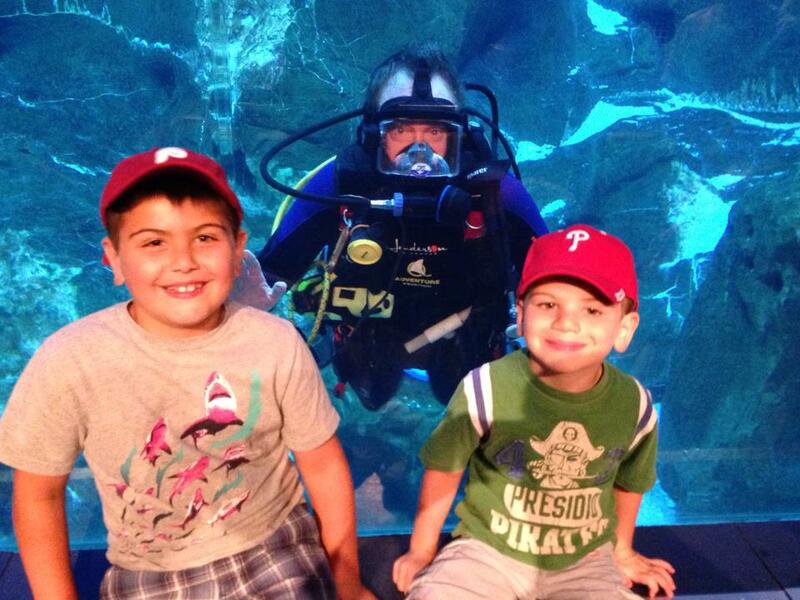 They really had exceeded the weight limit and my eldest son’s knees were pretty much touching his ears. 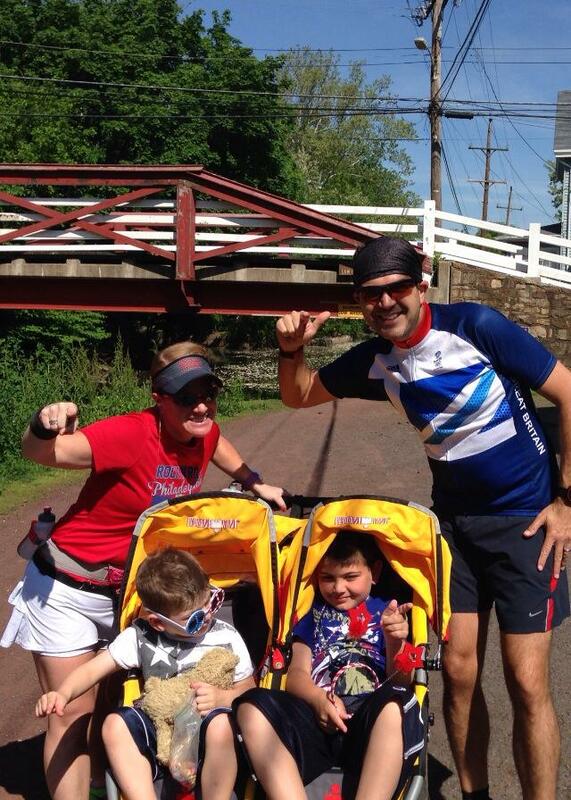 We had lots of fun with that stroller over the last couple of years and we put on a good number of miles together. It was great while it lasted but when casual observers commented that my son was big enough to push me we knew it was time. 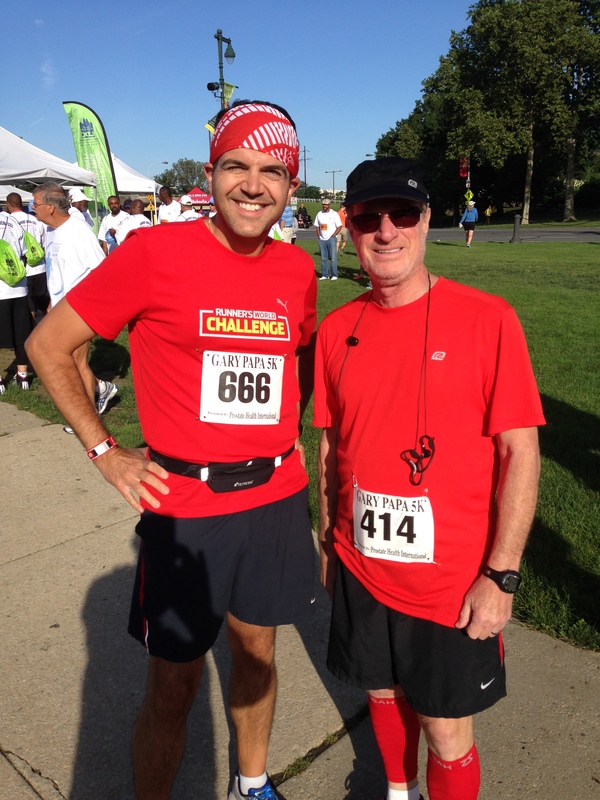 On Father’s Day I ran the Gary Papa 5K for Prostate Cancer and met up with my fellow Mickey Miler, Joe. It was nice to meet him and it was a fun day. I travelled down with my father in law and it was good to see him back running races. 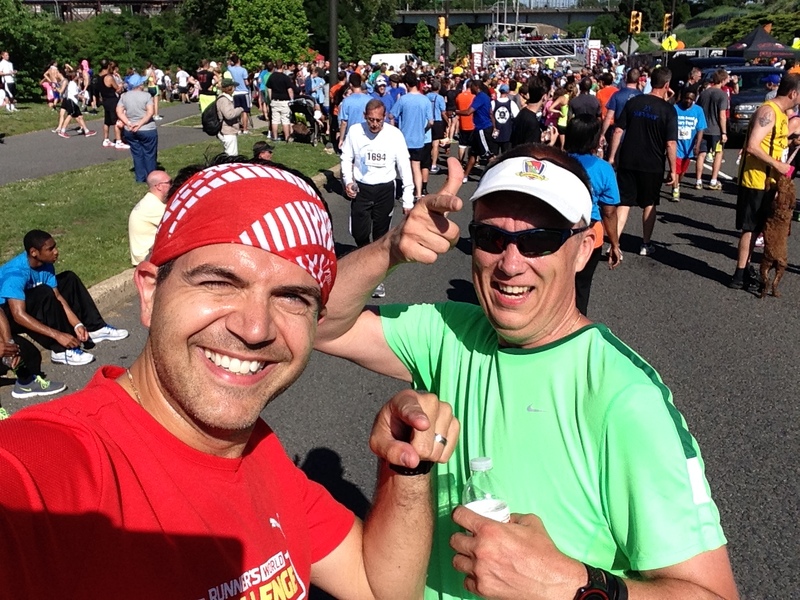 He is signed up for a few more this year including the Rock and Roll Philadelphia Half Marathon in September. Together with my wife, my sister in law and future brother in law we have a full caravan of cars heading down and it should be a fun day. 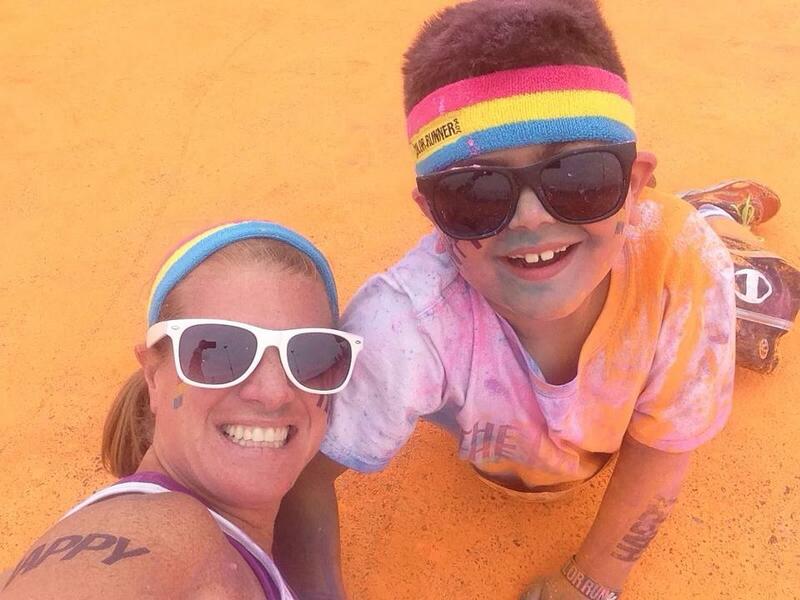 At the finish line with Joe. 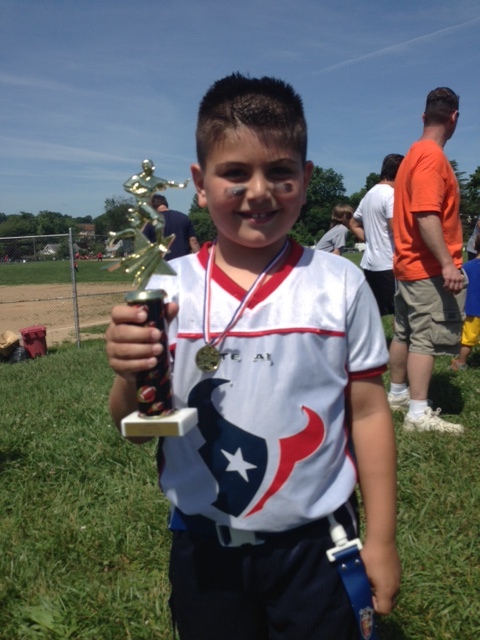 On Father’s Day we also go to celebrate my son’s team winning the Flag Football Superbowl. They were unbeaten all season. Now I have to start building my son’s trophy shelf. He was very happy and we are very proud of him and how he played with the team. This month also included the Cycle Bucks County event. This was the third year I have taken part in this event and it was a really beautiful sunny day. I opted for the 25 mile route (actually 27 miles) and there were also 10, 50 and 60 mile routes to ride. It was very hilly but a good workout. I did walk a couple of hills (as did many others) as I didn’t want to fry my quads and also as I had a 19 mile run on the training plan the day after. I earned my ice cream on this ride. With a net elevation of almost 1,900 feet it was a very good workout. You can see the route here. 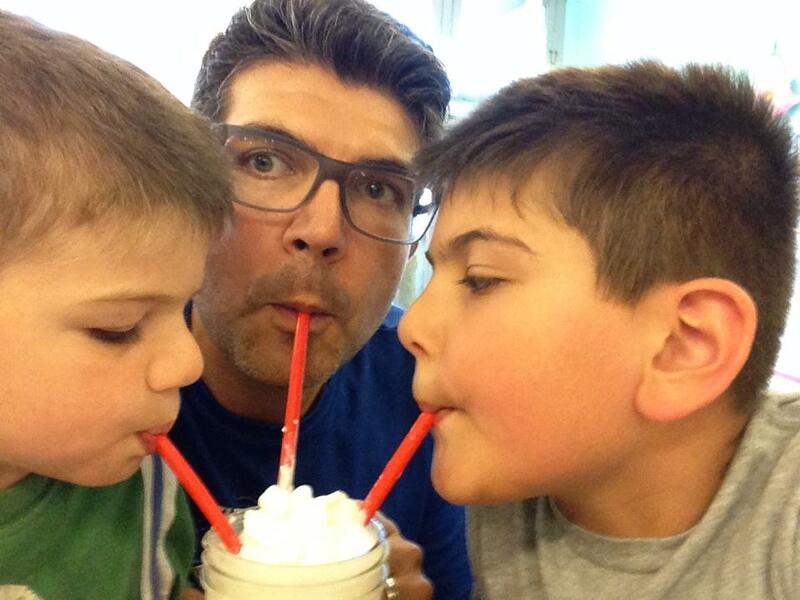 We had a pleasant surprise when my in laws offered to take our two boys up to Albany, NY for the weekend to visit family. My wife and I had free time which we had not planned that weekend and we took advantage of having some personal time on Saturday to get some stuff done which we wouldn’t have had a chance with the boys around, go out for a nice relaxing dinner and catch a movie. The next day we could sleep a little later and both get our long runs in. I had 19 to run as I said earlier and my wife joined me at mile 8 and we ran my last 11 miles together. She took me to some places in Tyler Park that I had never visited and some hills I had never run before (probably not planning to run those again either). We then had a nice quiet brunch and then headed out to an evening concert (The Steve Miller Band and Journey). A great weekend. 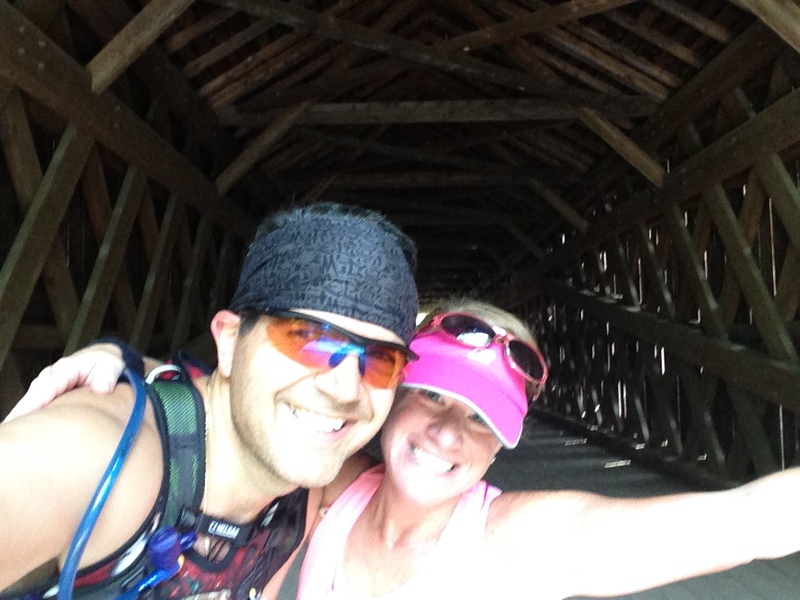 Running the ‘Covered Bridge Trail’ in Tyler Park. A first for me. Work took me to Atlanta, Georgia this month (and I will be heading there a few times this year). My hotel was nearer Piedmont Park this time around and the office I needed to visit was next to my hotel. 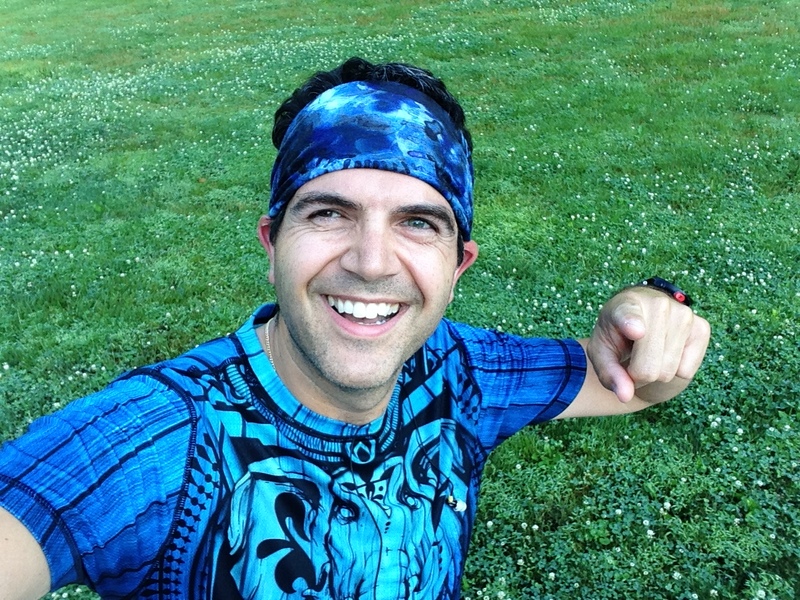 With the exception of my first travel day when I headed straight to the office I was able to run every morning. With my short commute (next door) I was able to get my longer training runs in without getting up so early. 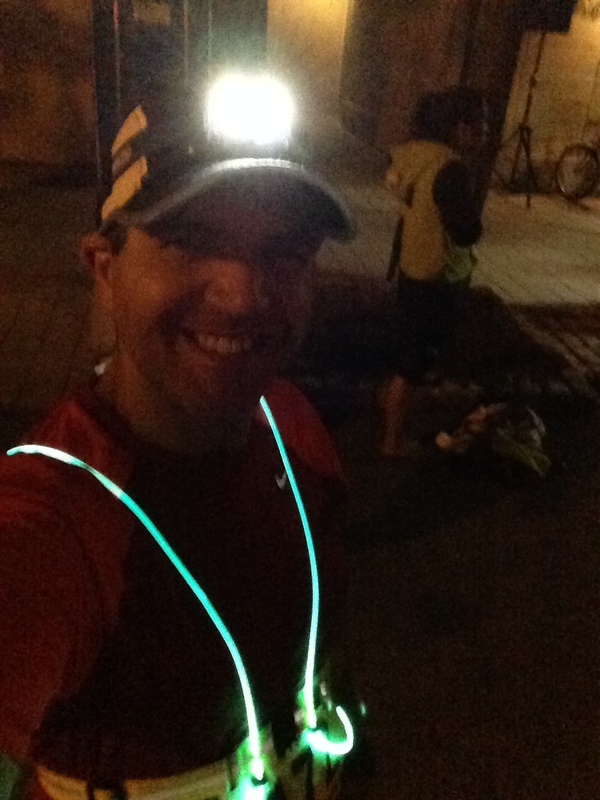 I usually commute about 55 miles each way so I have to get up early to get my running in. This was also the first of my big weeks on the training plan and it called for runs of 5, 10, 5, 10 and 20. The sun does rise later as we are further west so I had my headlamp for both of the midweek long runs but was able to finish in the day light. 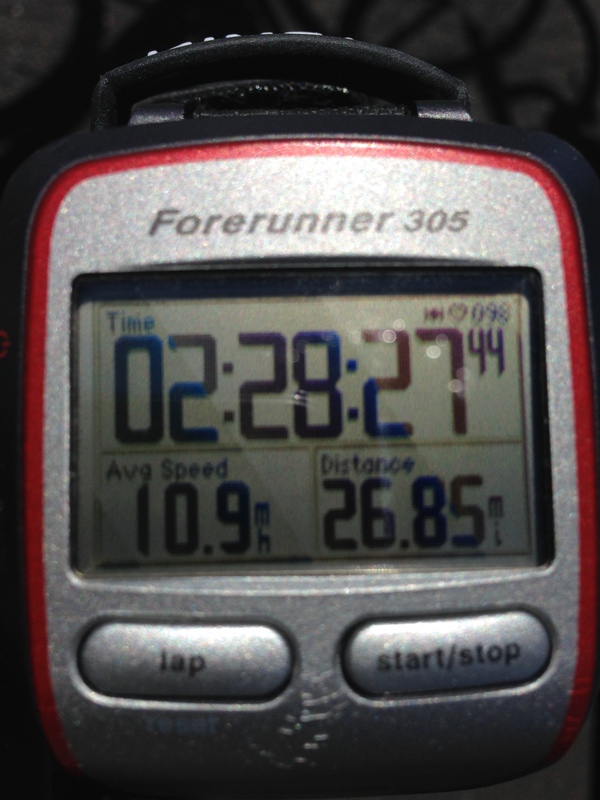 It was warm and humid but good training for the heat I will expect in August. While in Atlanta I got the chance to catch up with ‘Fast Eddie’ McCoy. 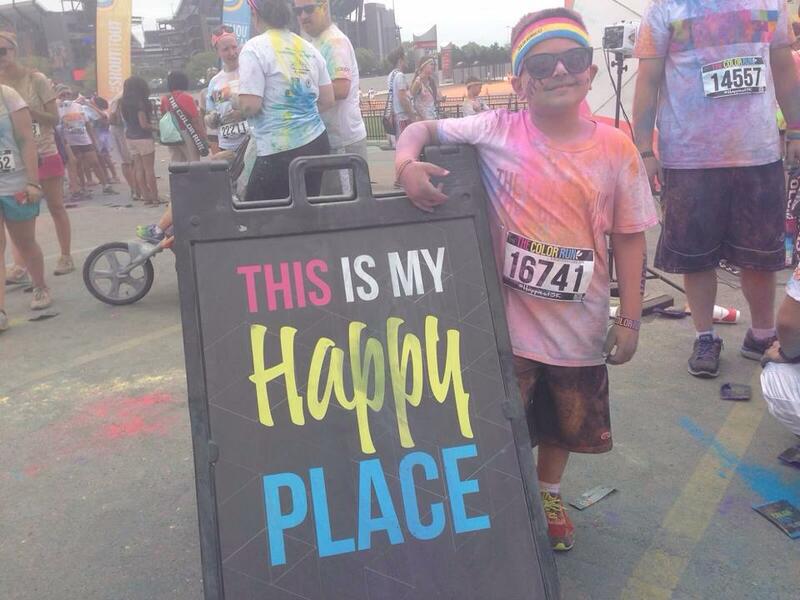 He is a big part of the Mickey Milers running team and is a big inspiration to many as well as lots of fun. He met me on Wednesday evening while I was there and took me out for a group run from one of the local breweries (Red Brick Brewing Co.). It was about 90 degrees when we ran and it we hit some pretty big climbs. Eddie is fast and his slow is my fast. I was keeping up but it was a hard and fun workout, especially considering the heat. We shared a couple of beers and then had a really nice dinner at Tin Lizzy’s Cantina in Midtown Atlanta. I will definitely be heading back there when I next visit. The last couple of trips to Atlanta I have participated in group runs. I will be looking into doing another one evening on my next trip as I will be travelling solo next time. 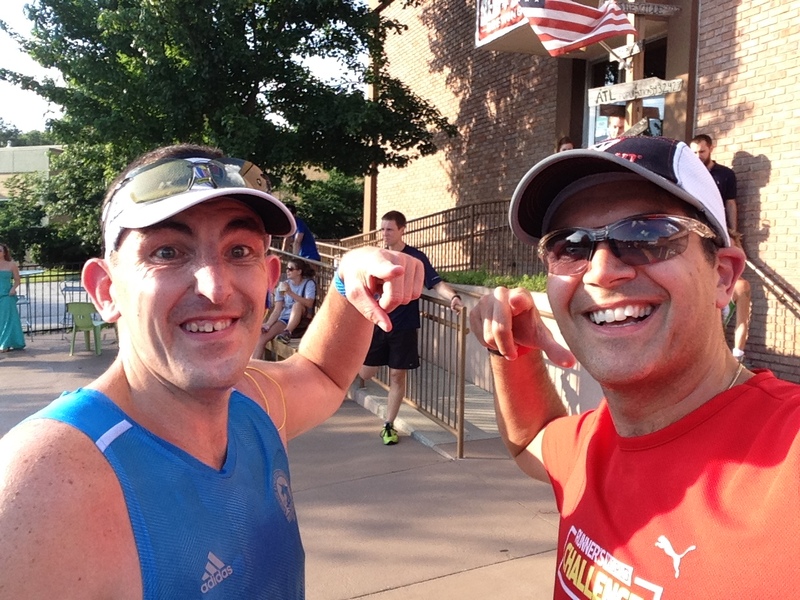 Post 5K run with Eddie. 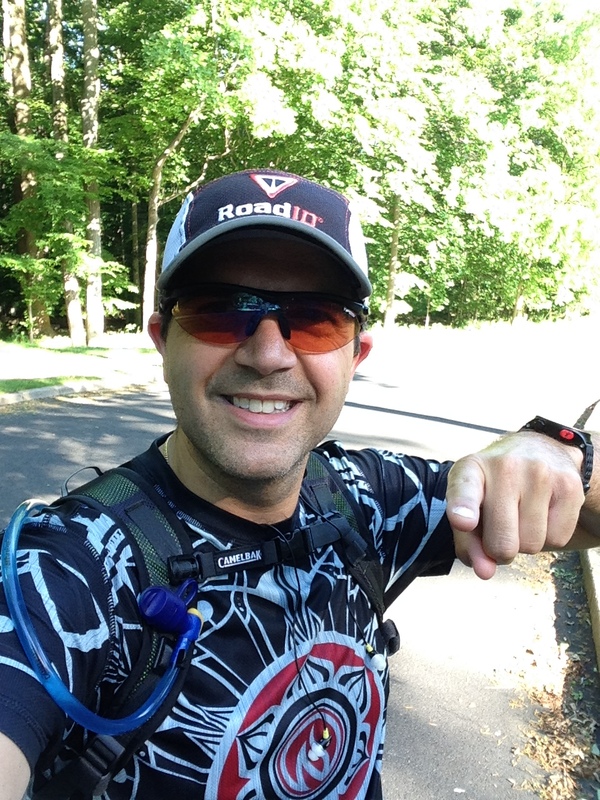 I finished off the month with a 20 mile long run when I got back from Atlanta. 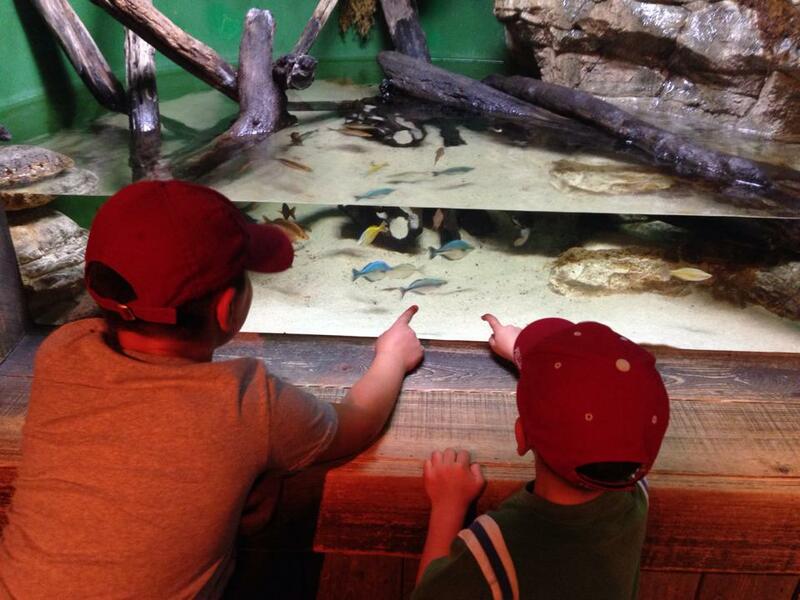 It went well and I felt good even the day after when my boys and I had a crazy busy day together using our membership at the Adventure Aquarium in Camden, New Jersey. Also new this month, for me anyway, were my new shirts from ‘INKnBURN‘. I took advantage of some discount codes online and purchased a few items. I’m really happy with them. 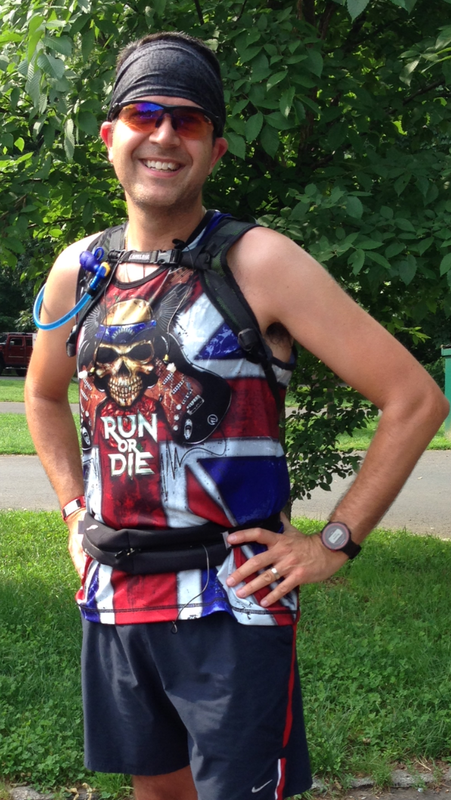 I think the shirts are great and they work well as technical running shirts. Very comfortable. It was a busy month and I had lots of time on my feet outdoors both training, running with friends, running with my wife and playing with my boys. I’d say June was a success. Looking forward to the rest of summer. While I have your attention (if you have stuck with me this far I guess I have) I’d like to remind and ask you if you would be willing to support me in my fundraising efforts for Autism Speaks. 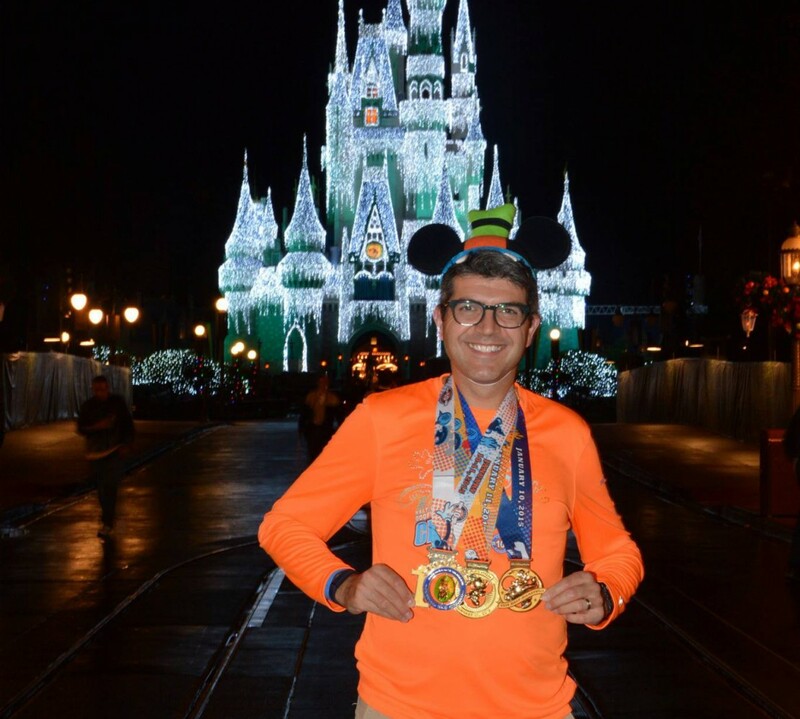 As you may know from this blog I will be running the 2015 Walt Disney World ‘Goofy’s Race and a Half Challenge’ with Team Up / Autism Speaks. This will be my third year running for this team and I hope to take my total raised over the years to over $10,000. I cannot do this without everyone’s support. If you feel you can contribute I would very much appreciate this. I thank you in advance. You can donate by using this link. Thank you for reading and have a great summer.